Tamron 24-70mm - such a sharp lens, a perfect all-rounder. I can use it for landscapes as well as portraits, and great for street photography! Canon 100-400mm f4.5-5.6L ISii USM - perfect for surfing and wildlife shots. Can I tell you guys……it’s taken me quite a while to figure out what I want and need in lenses. I tried a Canon 17-40mm (didn’t like it). I tried a Canon 50mm (didn’t like it), I tried a Canon 85mm (didn’t like it). Lenses are such a personal thing and it depends on what you use them for. There are companies around who rent out lenses. I suggest you try to rent one before you invest in buying one!! Also, invest in the BEST glass you can afford. I saved up for the 70-200 for ages before I could afford to buy one, and it will never leave my possession. it’s that good, so it was worth the wait! I use Sirui tripods, the W-series. They are waterproof and carbon-fibre. They are fantastic at being constantly in salt water and sweltering in the boot of my hot car. I’ve got my regular one, the W2204, and recently I acquired a W1204, it’s a little bit smaller in size and lighter, so i use that for travel. I made the investment into NISI filters a couple of years ago, and I use them almost every day. I use the v5 square system, a selection of Neutral Density (ND) filters: a 3-stop, 6-stop and 10-stop, plus a few graduated filters, and Circular Polarising filter, and a Natural Light filter. Interestingly, filters are the number one thing my students want to learn, so I teach how to use them, and how to get the best out of them. What else do i have …..hmmm well I have a GoPro Silver Hero4 which is fantastic when I go stand-up paddling, and I fly a DJI Mavic Pro drone whenever I get the chance (I’ve posted some images in my gallery, check them out!). 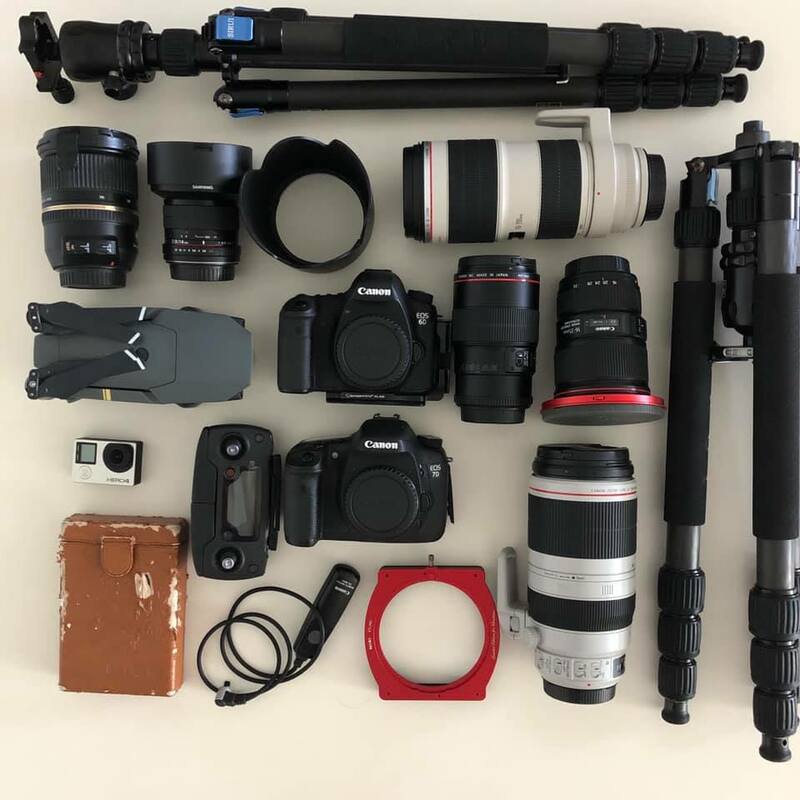 As most photography-related brands come out with new gear all the time, unless you are sponsored by the brands and given the use of gear as it updates, it’s hard to keep up, and frankly, quite expensive. I would rather spend my money on travel (so far i’ve travelled to 7 continents…Antarctica was my absolute fave! ).